There is a long history of artists being based in Suffolk or visiting on a regular basis to draw, paint, sculpt or make prints in places such as Aldeburgh and Southwold. Not surprisingly, therefore, the county is rich in artistic talent. As a destination with inspiration, Suffolk is important for wildlife, landscape and even abstract painters and printmakers. This volume is a compilation of contemporary printmaking organised by location, taking readers on a journey from the south-eastern corner to the north-western tip of the county. We cannot guarantee that you will find your favourite place among these pages, even though 51 ‘spots’ appear on our map of featured sites. Artists are proudly independent and notoriously free-spirited. Their subjects are seldom chosen solely for commercial appeal, and they will often avoid the more predictable locations. It will come as no great surprise that the much-loved slice of east Suffolk coastline has attracted the most artists, with Aldeburgh and Southwold in particular providing much contributing printmakers. However, pretty inland towns and villages also provide the basis for many linocuts, etchings, collagraphs and wood engravings. 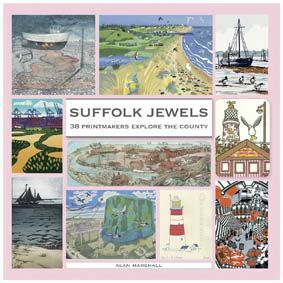 At this point we should explain that all of the work reproduced in Suffolk Jewels is contributed by printmakers. Many of them also paint and some even sculpt or throw pots. However, it is their original printmaking that graces these pages. 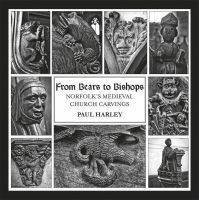 Common to this book and its sister volume Norfolk Gems is a desire to showcase a remarkable diversity of printmaking approach. Even within the main disciplines, namely woodcut, linocut, wood engraving, etching, mezzotint, drypoint, engraving, screen printing, collagraphs, lithographs and monoprint/monotype, there are great variations of technique and style.